Public health providers and agencies working in southeastern Wisconsin can expect a fresh infusion of talent within the next few years from the Zilber School of Public Health’s first bachelor’s degree program. The University of Wisconsin System Board of Regents unanimously approved the new Bachelor of Science in Public Health degree on Friday, June 8. The program will begin admitting students in Fall 2018; classes begin in Spring 2019. According to university projections, more than 200 students will enroll in the program in its first five years. Friday’s vote brings the number of degrees offered at Wisconsin’s only certified school of public health to five. The new program is the first undergraduate degree offered by the Zilber School, which opened in downtown Milwaukee in 2009. The Council on Education for Public Health certified the school in 2017, making it one of only 61 dedicated schools of public health in the nation. “Expanding public-health courses, research opportunities and internship connections to more students will allow the Zilber School to be even more effective in pursuing our mission of advancing population health, health equity and social and environmental justice,” said Ron Perez, interim dean of the Zilber School. The new bachelor’s program will help meet the region’s and nation’s increasing demand for a diverse pool of public health professionals as Wisconsin’s public health workforce nears retirement age; a 2011 report projected that nearly 40 percent would retire by 2020. Nationally, the Bureau of Labor Statistics has projected faster than average growth from 2016-2026 in numerous job categories relevant to public health graduates, including health educators and community health workers, environmental scientists and specialists, social and community service managers and statisticians. “With this degree, we’re not only improving outcomes for the region, we’re also giving our students more of what they have come to expect from UW-Milwaukee – direct access to a rewarding, life-changing profession that will experience rapid growth,” Perez said. Public health work can have a significant impact on the community, particularly in highly urban or highly rural communities. Milwaukee, for example, ranks 71 out of 72 Wisconsin counties for health outcomes (e.g. quality of life), health factors (e.g. behaviors) and social and economic factors (e.g. childhood poverty). Fourteen new courses have been created to support the new degree, the result of a three-year planning effort by Zilber School faculty, led by associate professor Lorraine Halinka Malcoe. The two-semester course sequence, Public Health from Cells to Society, will use Milwaukee’s lead poisoning crisis to teach the fundamentals of public health intervention and illustrate the many ways the profession works to improve health outcomes at the community level. “Students get to see everything about lead poisoning from where lead is found in the environment and how it gets into the body to what it does to the human body at a cellular level,” Malcoe said. The second semester of the course examines policies, from building codes to legislation governing Wisconsin’s rental industry, that determine who gets exposed to lead and who doesn’t. This population-based approach is a defining difference between public health professionals and medical professionals. Miller says her coursework and lab experience in UWM’s psychology program have given her insight into how human behavior affects health. Working with Zilber School biostatistics associate professor Paul Auer has helped her develop analytical and computational skills to examine large collections of public-health records. Combing the two to research myelodysplastic syndromes, a rare grouping of blood cancers that can affect people who have been exposed to chemotherapy, Agent Orange or who have Down syndrome, illustrates how public health work requires a specialized skillset to look at large-scale health issues. The Bachelor of Science in Public Health will require 120 credits, including at least 39 credits of general education and foundation courses, 54 public health major credits, and 27 elective credits tailored to each student’s interests and career goals. Fourteen new courses have been created to support the new degree. 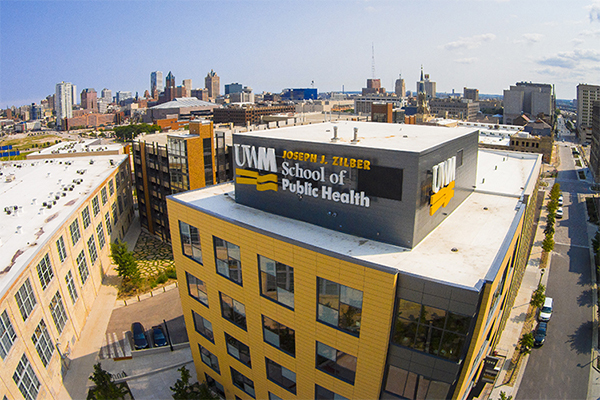 The Zilber School currently has 25 full-time faculty across several major public health areas (biostatistics, community and behavioral health promotion, environmental health, epidemiology, and public health policy and administration).